Company Law Ready Reckoner is a comprehensive guide to the Companies Act, 2013. The book presents topic wise analysis of the concepts underlying the Companies Act, 2013. The chapters are based on the provisions of the Companies Act, 2013 as amended by the Companies (Amendment) Act, 2017 with updated Rules, Forms, Notifications, Circulars and Orders issued under the Companies Act, 2013. 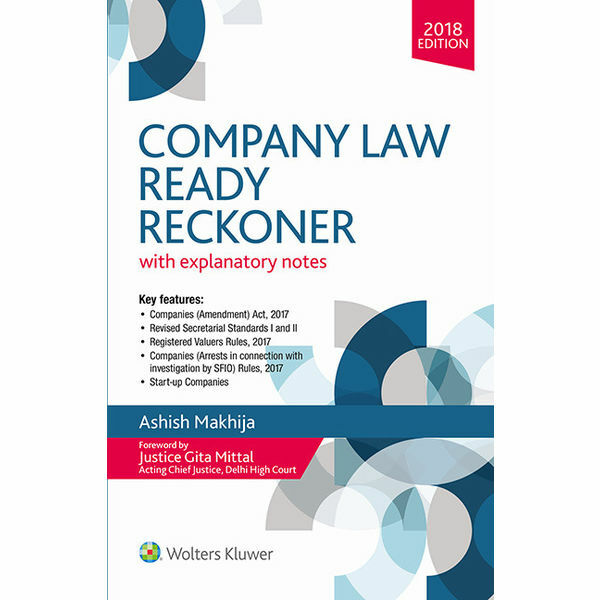 The chapters in Company Law Ready Reckoner have been scripted with the object of presenting the complex provisions of the Companies Act, 2013 in a simple yet effective manner. The quick notes, tables and judicial precedents in each chapter augment the explanation of intricate provisions touching the management and governance of any corporate. This book has been designed to be a companion of directors, compliance managers, corporate law practitioners, researchers to help them in their corporate endeavors. Revised Secretarial Standards I and II. Companies (Arrests in connection with investigation by SFIO) Rules, 2017. Ashish Makhija is the Managing Attorney at AMC Law Firm headquartered at New Delhi. He was the standing counsel for the Official Liquidator attached to High Court of Delhi for 6 years. He bears top credentials in the subject of company law. He has many books on the subject of corporate law to his credit. He is a renowned faculty and resource person on the subject of corporate law. He is an excellent orator and his sessions on company law attract top professionals and directors. He was introduced to the subject of company law at quite an early age and took to writing books in the year 2000.